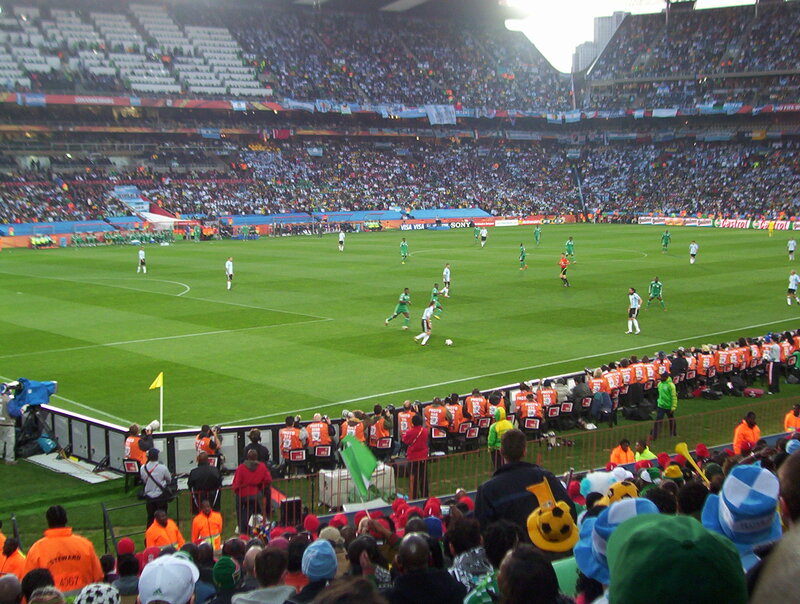 I had a sense of foreboding before Nigeria’s clash with group favourites Argentina. Argentina have quality throughout their side. 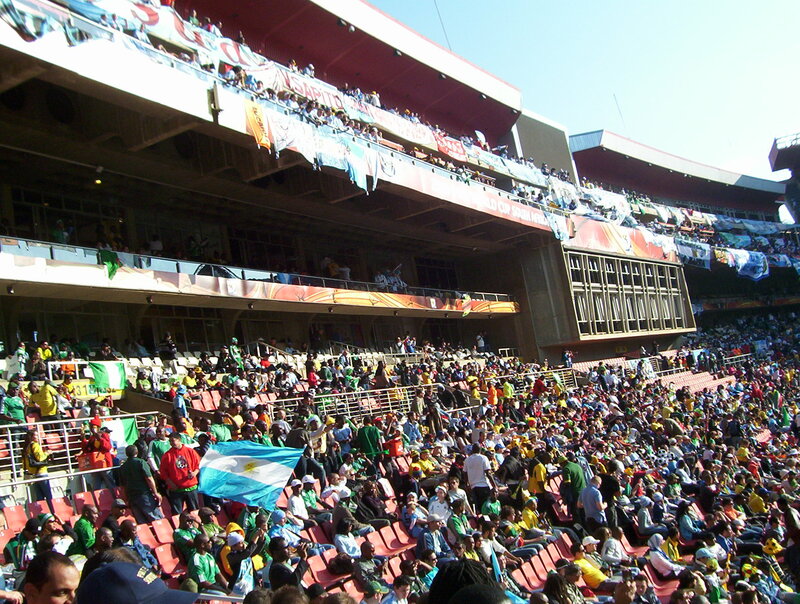 As I watched both sets of players warm up at Ellis Park in Johannesburg, I counted one by one, and gently whispered the names of the world class players I could see in their side: Messi, Walter Samuel, Higuain, Tevez, Veron, Mascherano…..it was daunting. South Africans were still in festive mood. I took a bus to the stadium. The bus ride was a mobile party. 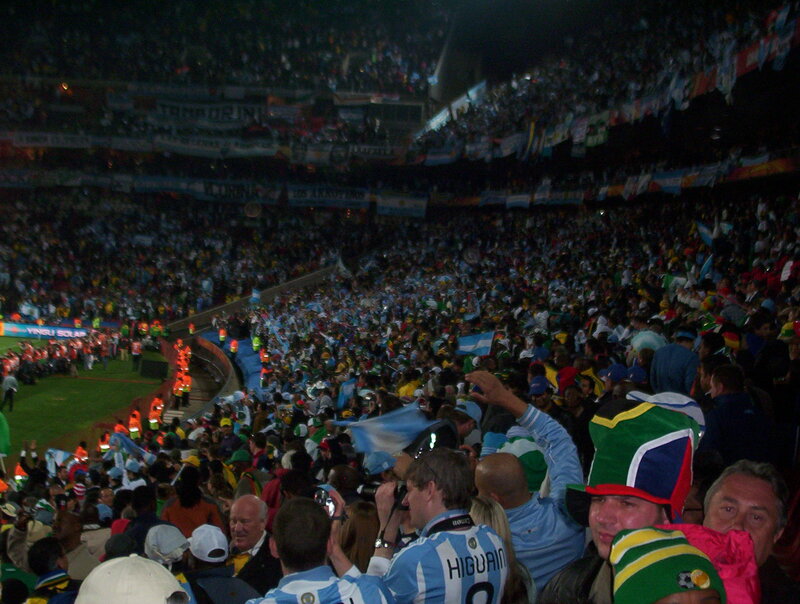 There were groups of South African and Argentine fans on board cheerfully looking forward to the game. The turning point came when a group of teenage girls got on board the bus at a subsequent stop. They instantly burst into song and dance, and their enthusiasm infected the rest of the bus. They sang in Zulu and English. The rest of the passengers (including yours truly) joined in as the whole bus sang and danced its way to Ellis Park. I’m surprised that the bus driver did not tell us to calm down. Everyone was stomping so hard on the floor that I literally thought someone’s foot would burst through the bus floor. As the noise inside increased, a police officer on board reached for his hip. For a split second I thought he was going to draw his gun! I was relieved when he reached for a handkerchief just above his pistol. Security was conspicuous as always. Police officers were stationed at the bus station, and two armed officers rode with us inside the bus. 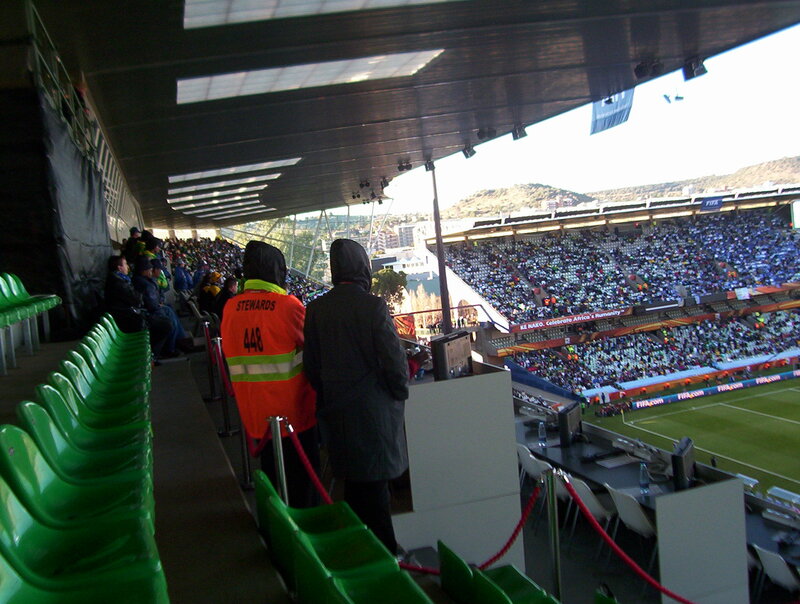 The police were helpful and cheery – as were the bus station attendants, match stewards and security. At the stadium fans had to pass through airport style metal detectors before entering. A security woman was very patient with me and explained that I could not take my water inside the stadium. All security officers were helpful, chatty and friendly. It was a brilliant exercise in how to police and provide security without being rude, alarming or threatening (American customs and security officials – take note). 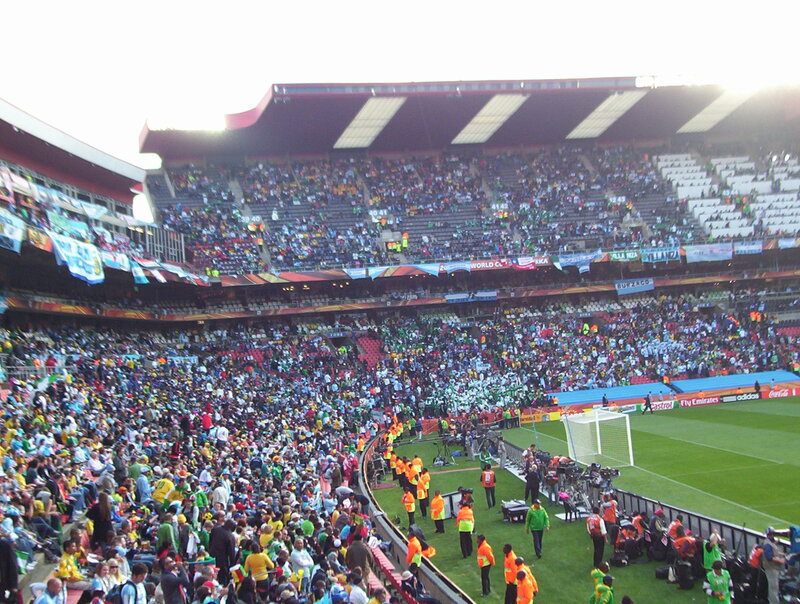 When we got off at Ellis Park, it was a see of blue and white Argentine flags and shirts, and green and white Nigerian flags and shirts. I saw some strange sights. An Irish group were supporting Nigeria. I also saw several Scotsmen in kilts and orange wigs. 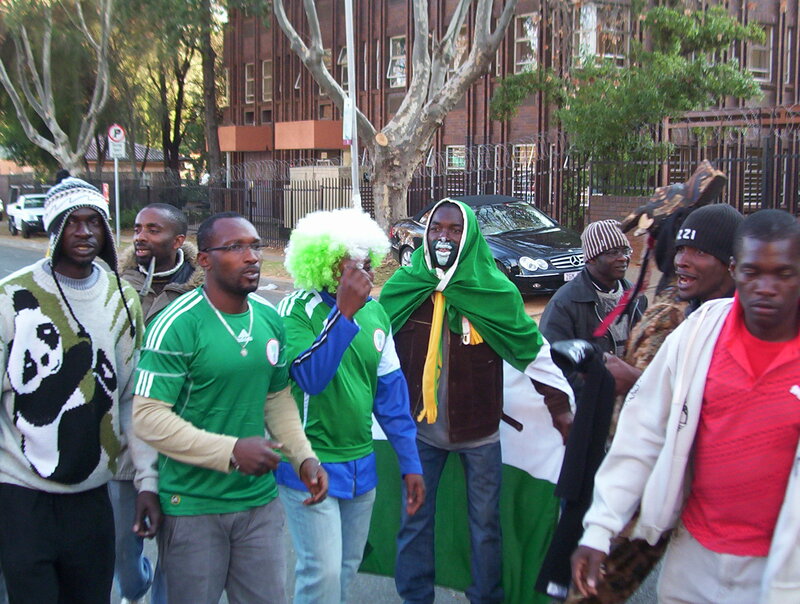 Outside the ground a group of Nigerians clad in green and white carried out what seemed to be a funeral ceremony. They carried a coffin with the blue and white Argentine colours painted on it. It seemed they were planning a funeral for Argentine football. 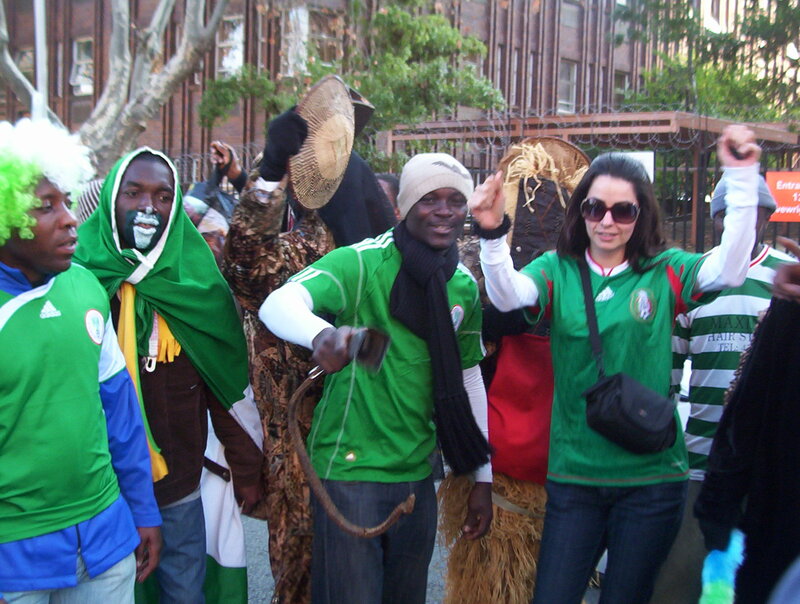 Another group of Nigerian fans wore masquerade outfits. Ahead of me, two Nigerian fans approached an Argentine couple and invited them to an after match party. It was they said, a party to celebrate Nigeria’s victory and to console Argentina on their loss. The Argentines simply laughed. Typical Nigerians – always running their mouths and letting their mouths write cheques their bodies cannot cash. 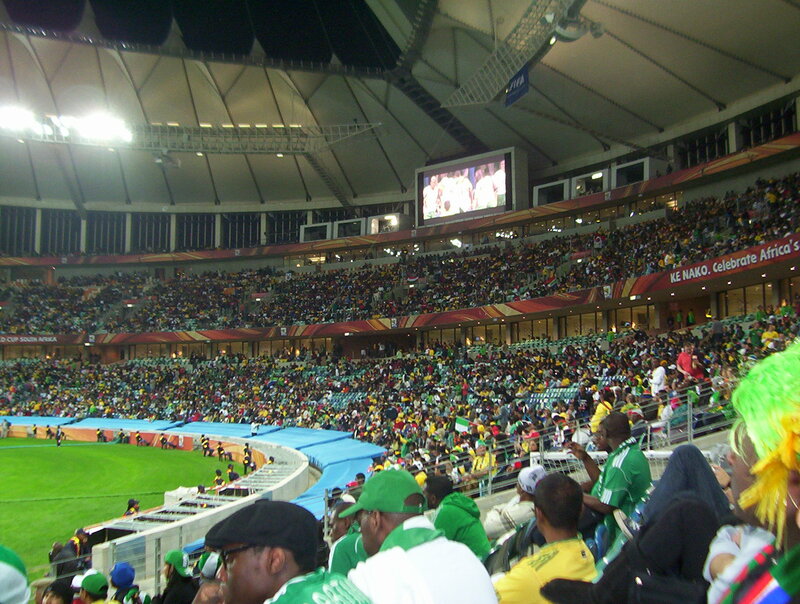 Inside the stadium it was a cacophony of noise. I arrived just as the Nigerian line up was being announced. No Osaze, Martins or Uche in the line-up. What? Why?! It got worse, first I sat in the wrong seat, then when I did find my correct seat, I was mortified to discover that it was totally covered in bird droppings. A very accurate bird had managed to sh*t all over my seat while leaving all adjacent seats unmarked. Great. I spent 90 minutes sitting in between seats to avoid the bird sh*t, and hoping the owner of the empty seat next to me would not turn up and force me to sit in bird mess. I was about 20 yards away from the pitch in the far left corner that Argentina attacked in the first half. 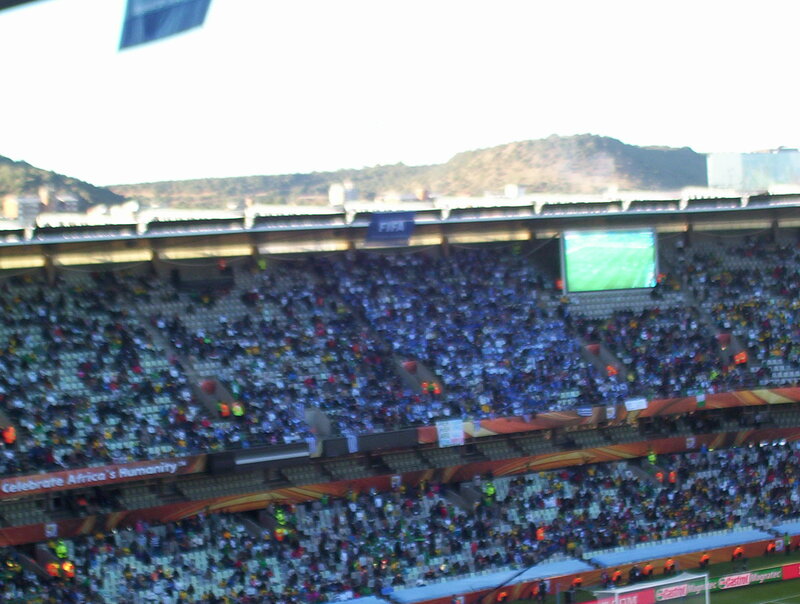 Argentine fans in the top deck (probably the equivalent of Italy’s ultras) beat their drums and unfurled banners from Boca, River and bearing slogans not intelligible to me. They were a noisy bunch. 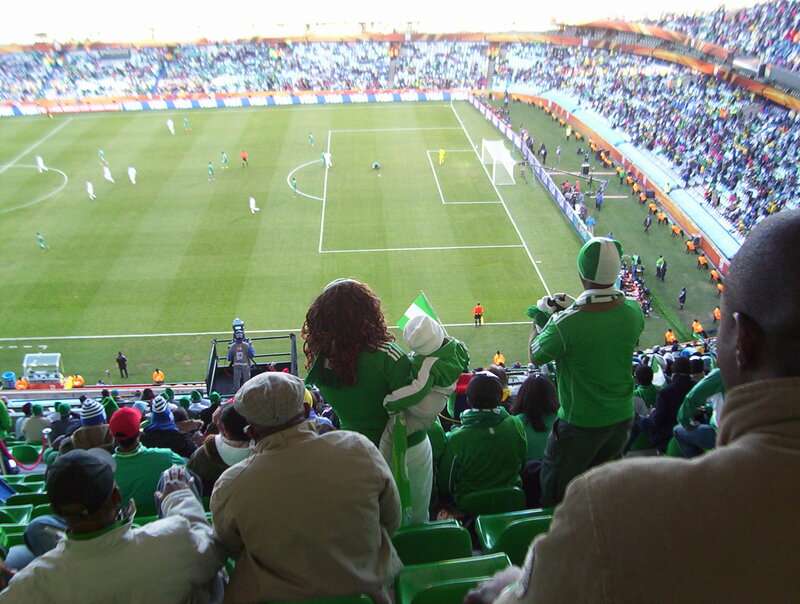 Although they were outnumbered by the Argentines, Nigerian fans took them on with trumpets, dancing and singing. 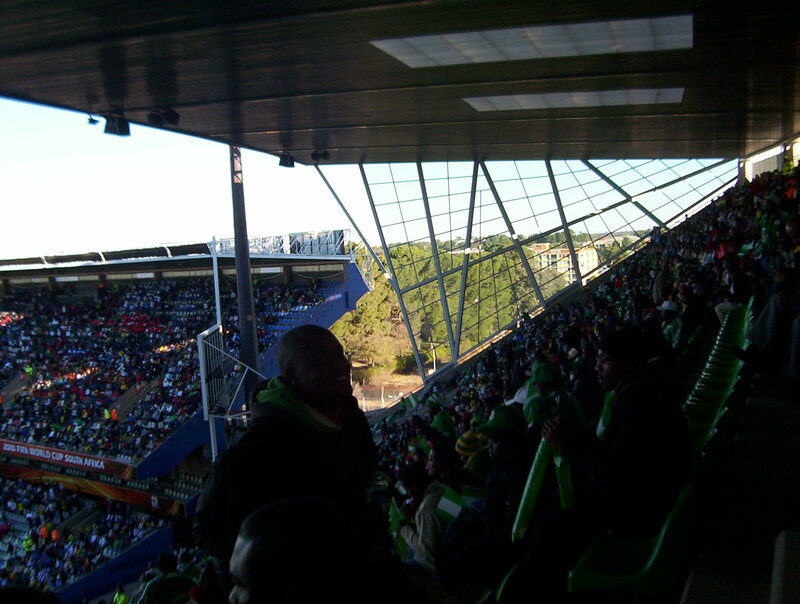 The Nigerian football supporters club sat about 100 yards opposite me. It was deafening, but good-natured inside the stadium. 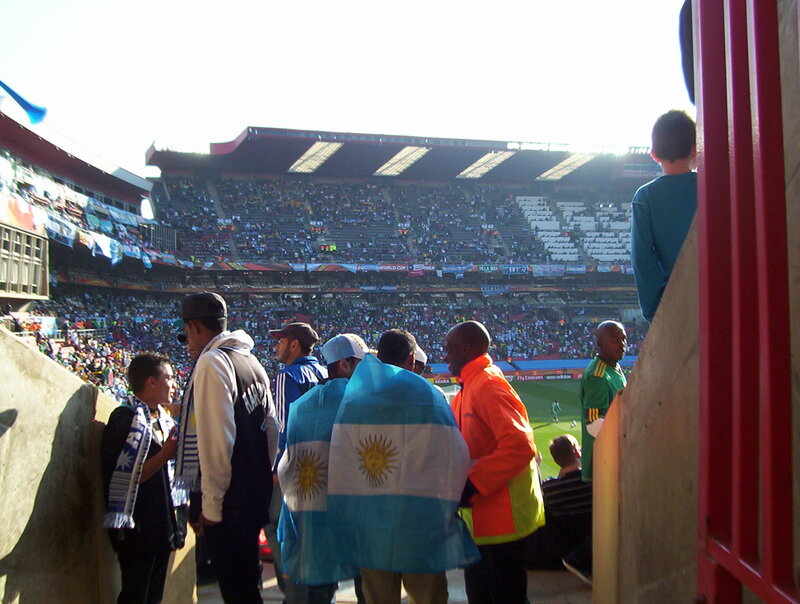 There was no segregation and Argentine and Nigerian fans bantered and took photos with each other. A man in front of me had the Nigerian flag painted on one cheek, and the Argentine flag on the other. 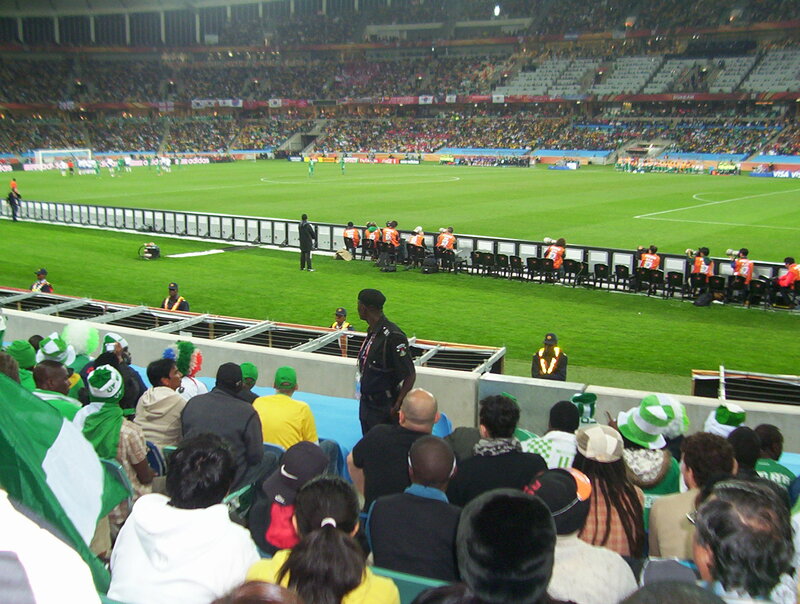 A Nigerian fan asked him to get off the fence and pick a side – Nigeria! 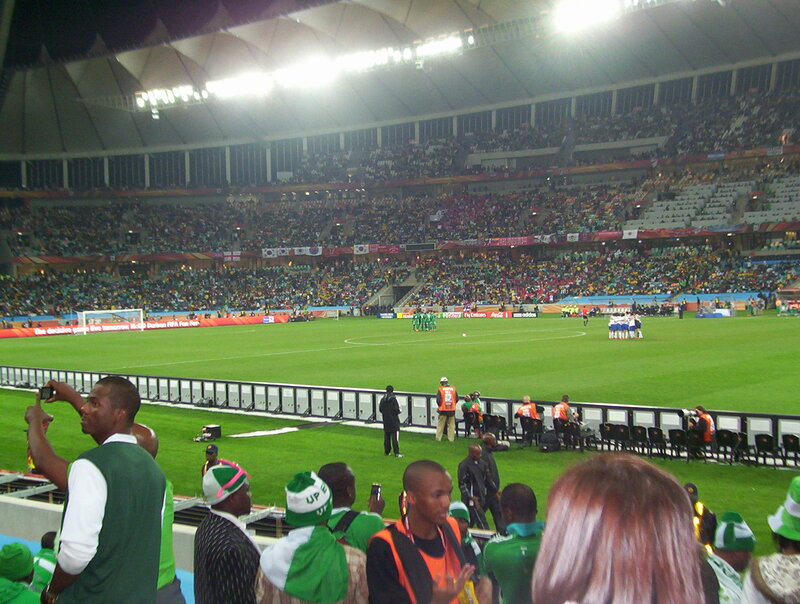 The Nigerian national anthem was sung with gusto and great noise which shocked the Argentines. 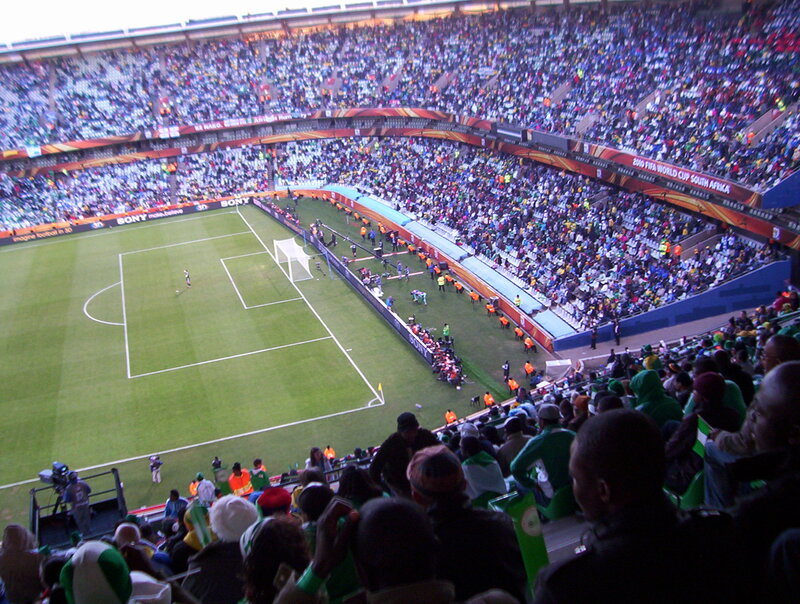 I could see visibly surprised Argentine faces at how many Nigerians there were inside the stadium and how passionately they sung their anthem. Nigeria started by doing the worst thing possible in football. Giving the ball away to Messi. Etuhu started badly, giving the ball away and not setting a good example for his junior midfield partner Haruna. Argentina were bright early on because Haruna (getting caught in possession, giving the ball away) and Etuhu were so poor. I could not believe my eyes when Heinze was left totally unmarked to head Argentina into the lead. But Nigeria had chances to equalise, Obasi did a beautiful step over before firing across goal. 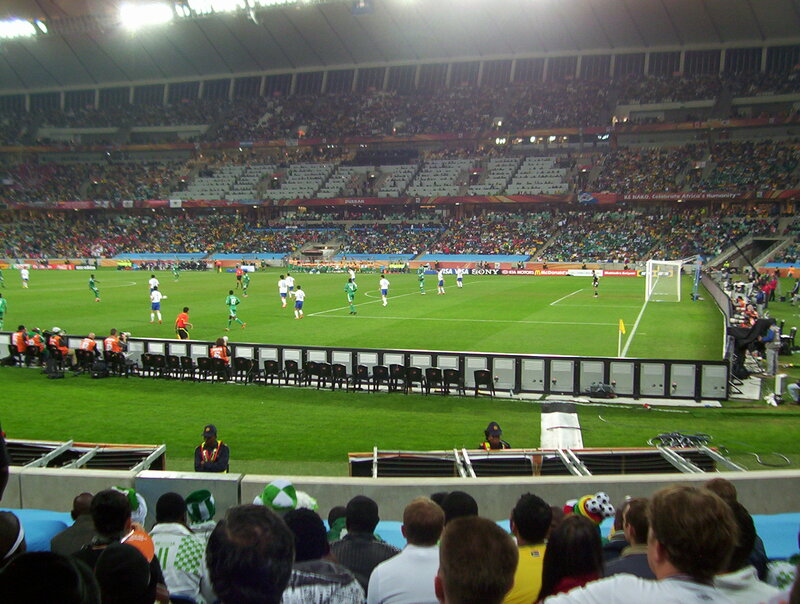 Enyeama kept Nigeria in the game with two great saves to deny Messi and Higuain. I was shocked that Higuain did not convert when one on one with the Nigerian GK. It was the sort of chance he normally buries at Real Madrid. I was momentarily distracted by an Arabic Muslim woman who (for some unknown reason) was carrying beer on a tray while walking down the aisle steps. She dropped the beer all over her son and fans sitting next to the aisle. 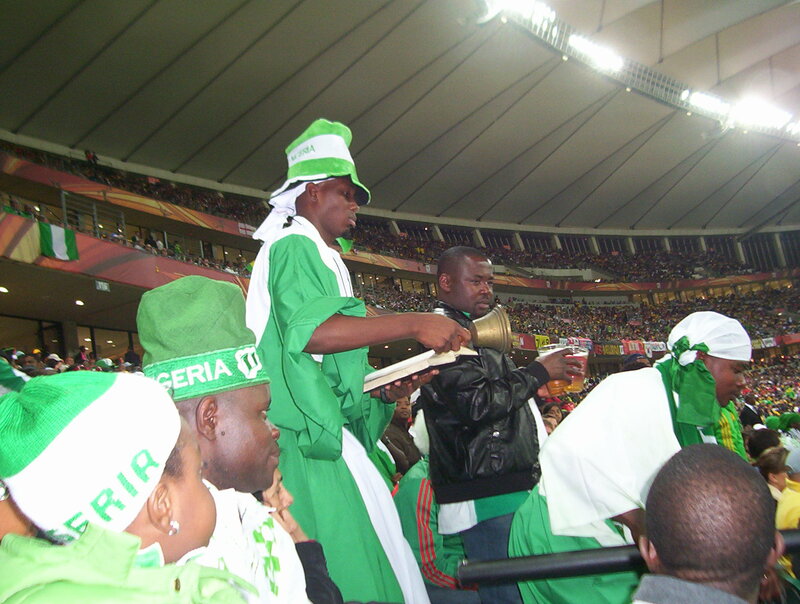 Speaking of beer, one drunk Cameroon fan was very upset and kept drunkenly screaming NIGERIA! NIGERIA! He seemed to have adopted Nigerian citizenship for the day. Nigeria huffed and puffed but could not blow down the Argentine house. Osaze came on for a few good cameos, but for some reason ran the ball out of play instead of going for goal. Yakubu had a clear sight of goal but chose not to shoot. He instead squared the ball to Kalu Uche who hit the ball over the bar from his weaker left foot. 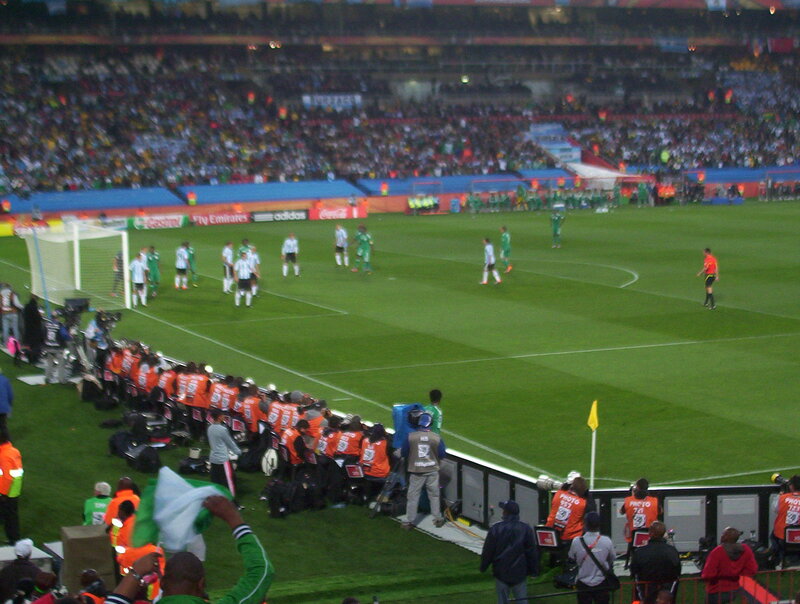 This Nigeria team seems shy about going directly for goal. They also build up too slowly and don’t attack with tempo. i.e. Nigeria under Lagerback is exactly the same as Nigeria under Amodu. The one player who was direct was Taye Taiwo. He hit a daisy cutter which went just wide of the post, but injured himself in the process and had to be taken off. Let’s hope it is not a serious injury. 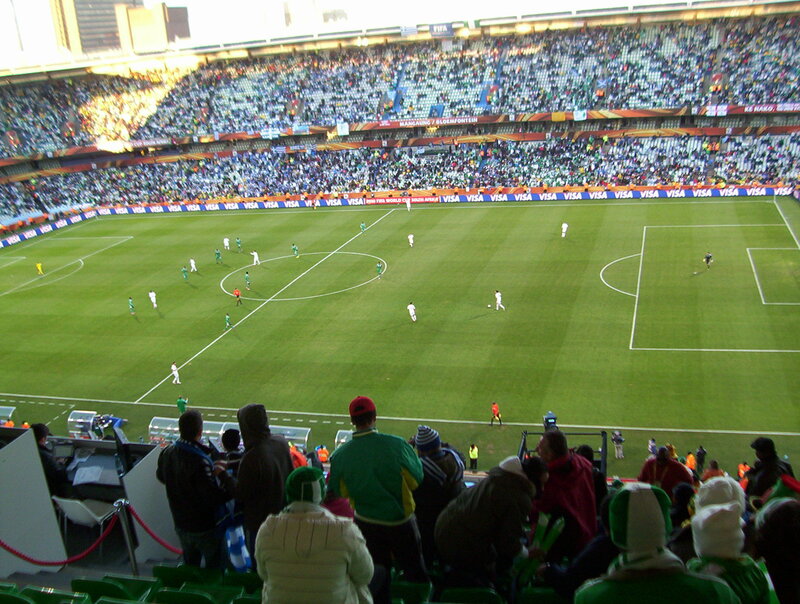 Argentina then frustrated Nigeria, ran down the clock, time wasted, and kept possession. Real bunch of hard nosed pros. They have Nigeria’s number. This match reminded me of the 2008 Olympic final. Nigeria playing well but not converting their chances. Argentina ruthless and professional. De ja vu. 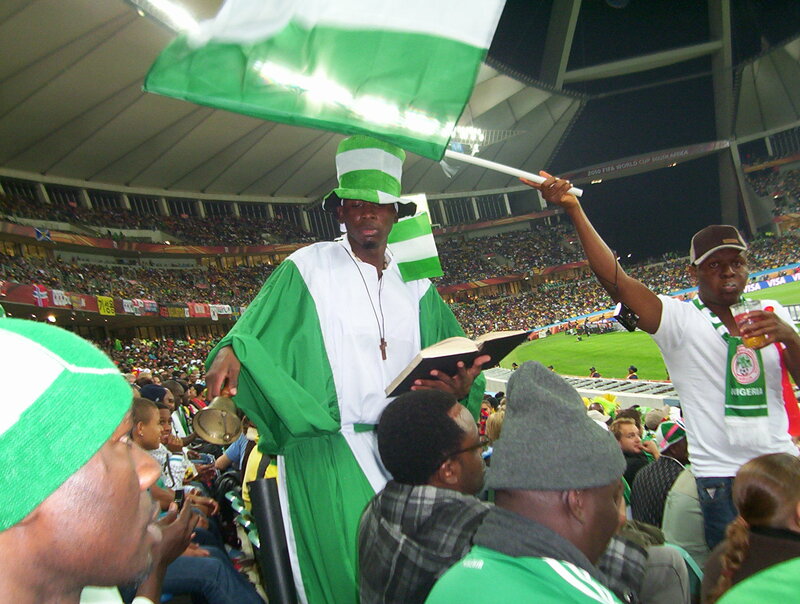 It was a creditable performance by Nigeria. Their application and effort was good, but there was no cutting edge or killer instinct. Yet, if they play like this in their next two games, they will beat both Greece and South Korea. Let’s not forget they were edged out by Argentina. Arguably the third best team in the world and having the best player in the world in its team. There was not a hint of trouble inside the game or outside the stadium. Everyone was helpful as usual. A bartender that gave me directions recognised me and stopped me to ask whether I found my way without trouble. After the game, the staff and stewards were on hand to direct people to buses to take them home. The staff seemed well drilled and knew exactly what instructions to give to fans and what to expect. I was impressed by the organisation and planning. Scores of buses started to ferry 55,000 plus fans home straight after the final whistle. 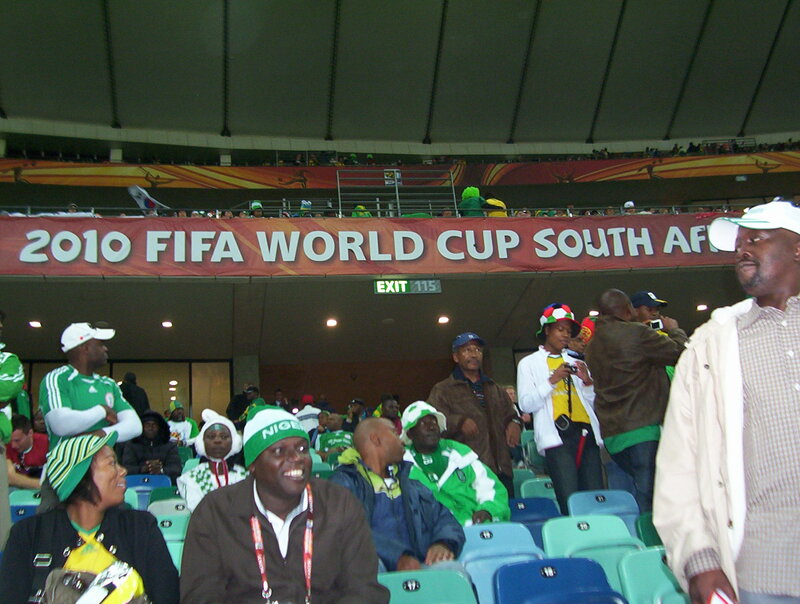 South African, Nigerian and Argentine fans exchanged friendly chats inside the bus home. By now it was dark, and as always, the police were present. A friendly bus driver volunteered advice to me. For my own security he said, I should carry my camera inside my jacket, not on top of it. I took his advice then got chatting to him. He said he used to live in Birmingham, England, when he “was in exile”. I naively asked him “what did you do?” to get exiled. It never occurred to me he could have been a member of Umkhonto we Sizwe (MK). He looked far too young. He said he was exiled for his activities during Apartheid. No need for further elaboration. He was an ex ANC fighter. He wished me well. 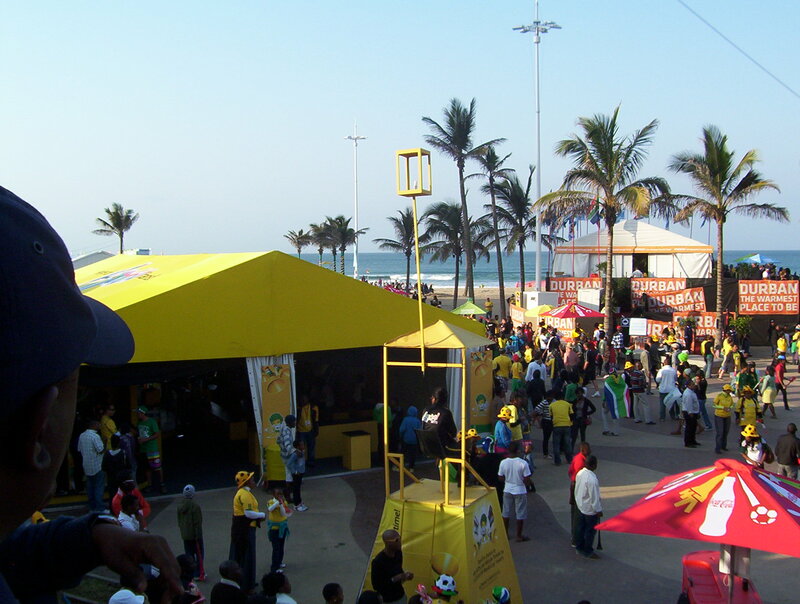 This World Cup has produced lots and lots of jobs for black South Africans. I hope they get to keep them when we all go home. *Lukman Haruna is not ready for this level. He looks raw and had a nightmare. He barely touched the ball in the second half. Even when he did, it was to give the ball away to Argentina or to overhit a corner. *Yakubu has an atrocious first touch for a top flight professional footballer. I lost count of the number of times the ball was played into him, only for him to lose possession with a heavy wooden first touch. *Many Nigerian fans do not know a good player when they see one. Those that have been calling for Joseph Yobo to be dropped are delusional. He was Nigeria’s second best player today (see below for the best player). He anticipated, tacked with precision, positioned himself well and read the game brilliantly. A great performance from the Captain. *Vincent Enyeama has come on in leaps and bounds since his days as a goalkeeper who could not catch at Enyimba. He was the Man of the Match. He pulled off several stunning saves to deny Messi and Higuain. The first decent GK Nigeria have had for a while. *Messi is brilliant to watch on TV, spellbinding to watch live. His close control and dribbling is mesmeric. The Nigerian players seemed in awe of him and were reluctant to tackle or close him down. How he failed to score today is a mystery given how many chances he had. Watching his off the ball movement was brilliant. He sat in “the hole” between Nigeria’s midfield and defence. Caused problems all game. He simply kept standing 5 yards behind Haruna and Etuhu in Nigeria’s midfield and rarely got picked up as Etuhu and Haruna did not know whether to drop deep to mark him, and Yobo and Shittu dared not come forward to mark him either, and leave Tevez and/or Higuain free. Strangely, Nigeria did not seem to designate anyone to mark Messi. *If Yekini was 20 years younger or Aghahowa was 10 years younger, Nigeria would have won this game. Nigeria failed to convert chances that a cold eyed finisher would have buried. Worst culprits: Yakubu, Uche and Osaze. 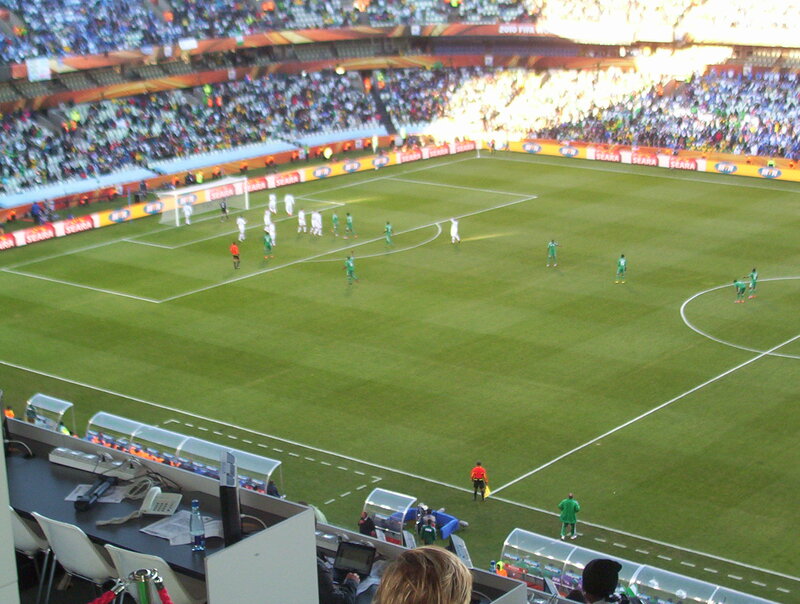 This Nigeria team lacks what Nigerian teams are known for: flair, pace in attack and free scoring. 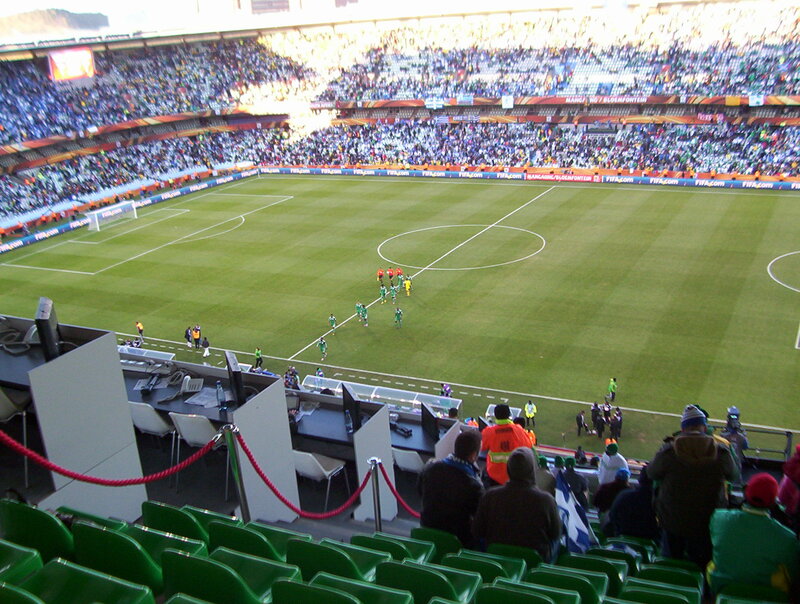 Next Report: Greece -v- Nigeria (Bloemfontein). Loser goes home. Its squeaky bum time. This is normally a history and politics blog. However I decided to talk about the one thing that is currently on everyone’s lips: THE WORLD CUP! 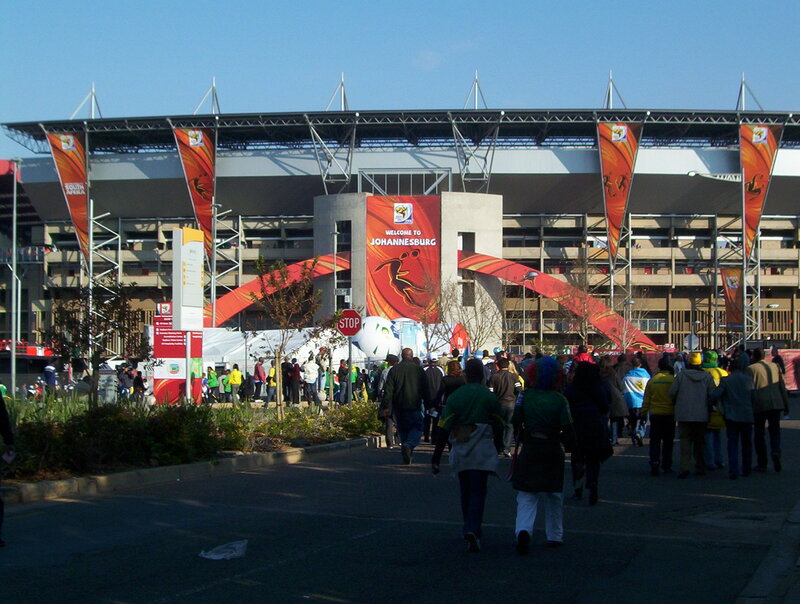 I am in South Africa to see the first ever World Cup on African soil. I hope the tournament will be a great success and will confound the prophets of doom predicting violence, murder and crime. My first impressions were that South Africans are beaming with pride and are bending over backwards to be helpful and to make the tournament a success. Everyone I encountered so far – from bus drivers, to airport check in staff, to shop assistants, has been ultra helpful. 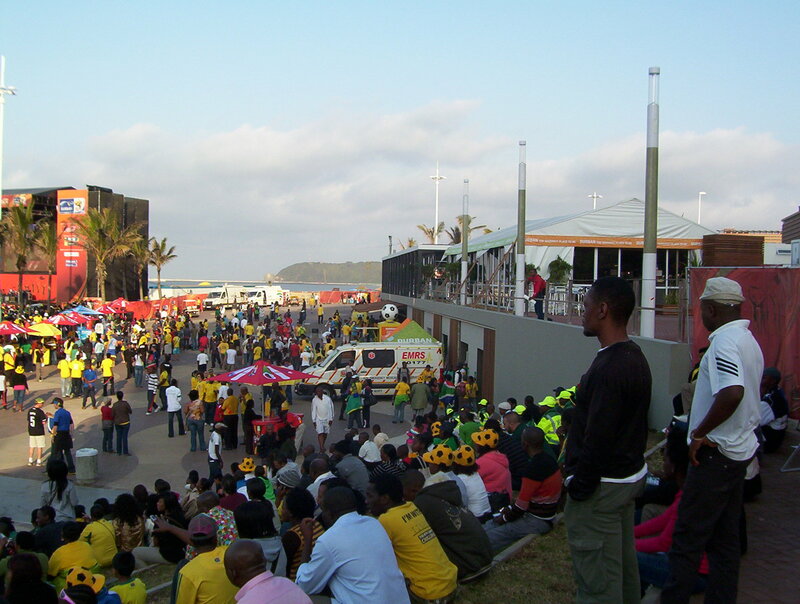 It seems as if everyone in this country is wearing the yellow shirt of Bafana Bafana. 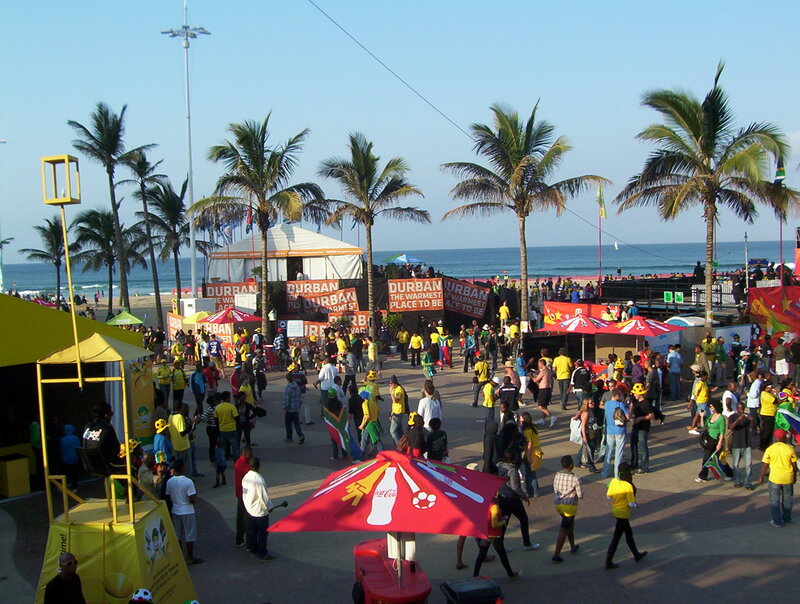 There is a carnival atmosphere – especially among the black population who switch effortlessly between English, Xhosa and Zulu as they chat energetically among themselves, with strangers, and foreigners. 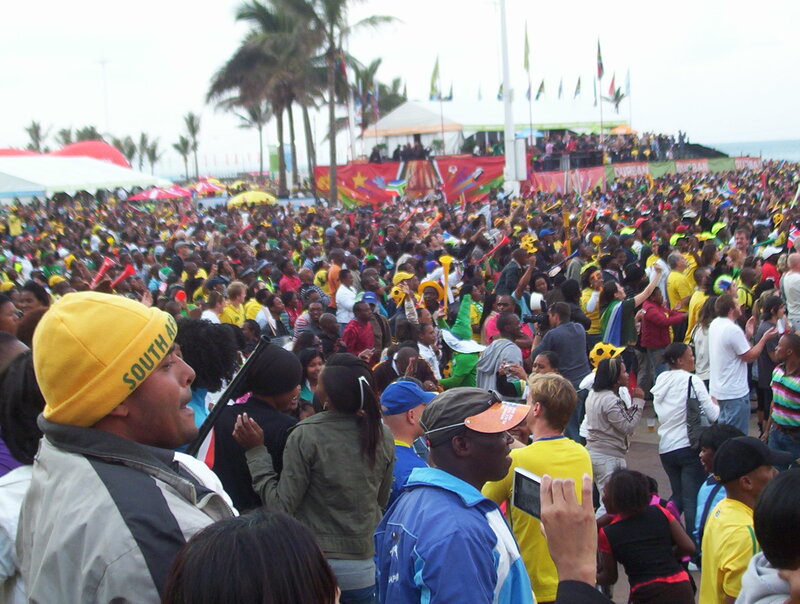 It seems that South Africans love to dance. I walked into a Woolworths store and one of the cashiers was standing at the entrance singing and dancing – just an hour before kick-off. At the airport, staff were doing the same. South African flags are affixed to the few cars on the eerily quiet streets. It seems that everyone is either at the opening game, or is at home watching it on TV. 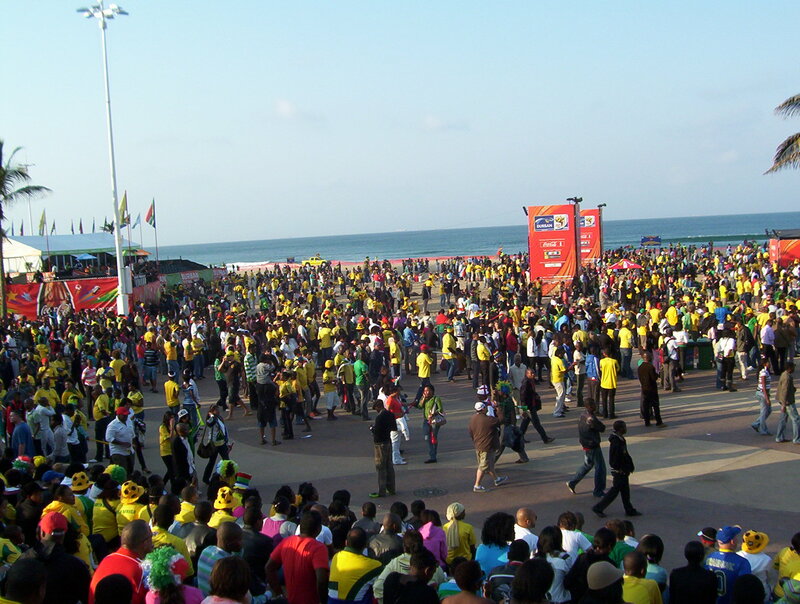 The car accident involving Nelson Mandela’s ex-wife Winnie, and death of his grand-daughter did not dampen the spirits of South African fans. Even though Madiba could not attend the match, every South African I spoke to was confidently predicting they would beat Mexico. I dared not tell them that I thought they were being overly optimistic. Mexican fans also seemed confident. 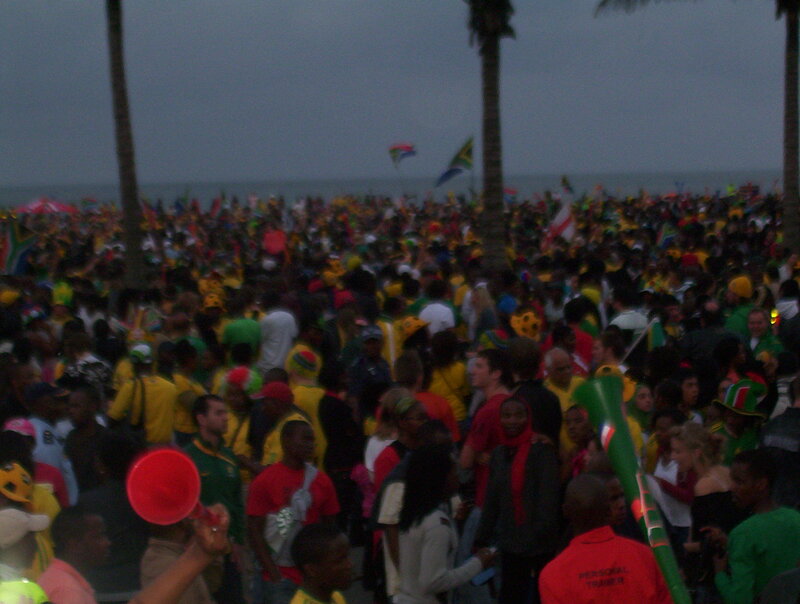 I encountred several of them triumphantly chanting MEXICO (with a “MEHICO” pronunciation) in Cape Town which temporarily drowned out the South African cheers. 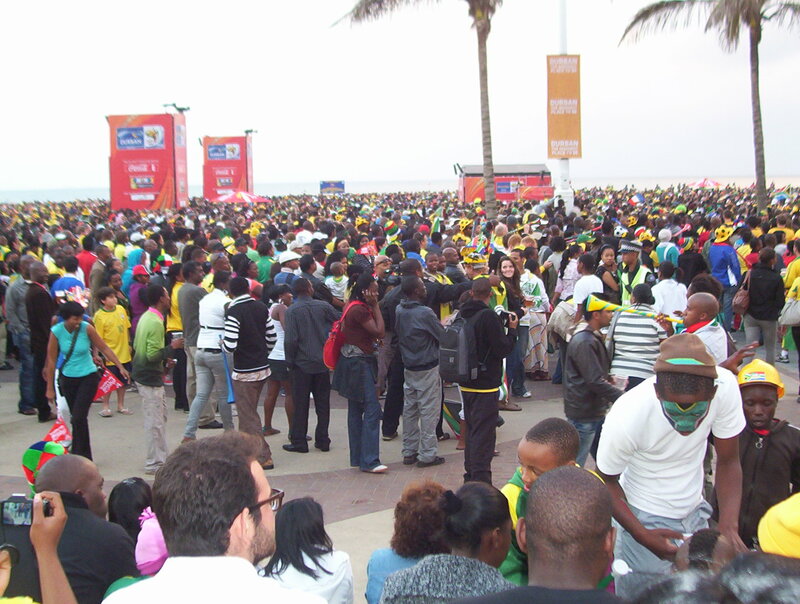 South African fans seemed very upset with Benni McCarthy and are glad he will not play. They seem to regard him as a disruptive influence on the team. I watched this game in a Johannesburg lounge full of South Africans. What struck me is that most of them were young (18-25) middle class blacks, stylishly dressed, brandishing iphones, smartphones, video cameras, and expensive watches. They seemed unaware (or did not care) about the various doomsday commentary that Western media has been writing about their country. 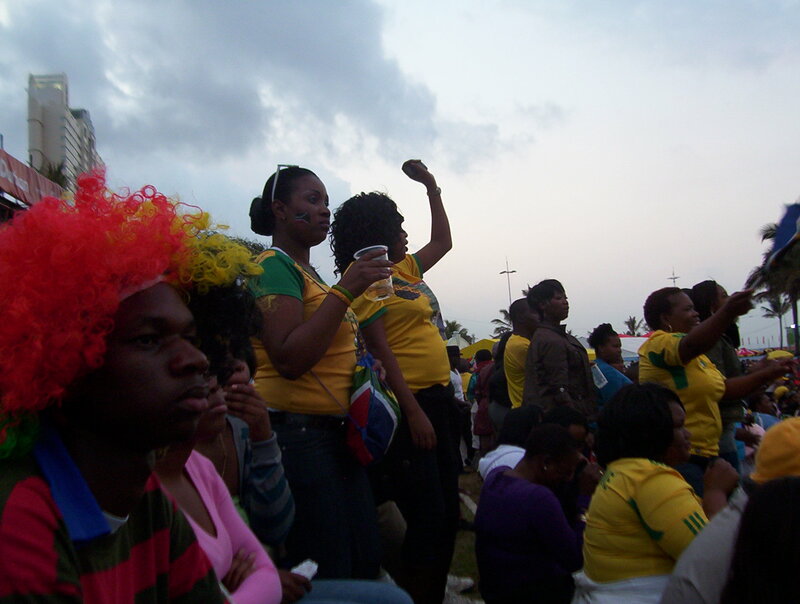 Another thing that struck me is that more women than men were there cheering on Bafana Bafana. Oh, and did I mention that many of them were strikingly beautiful? 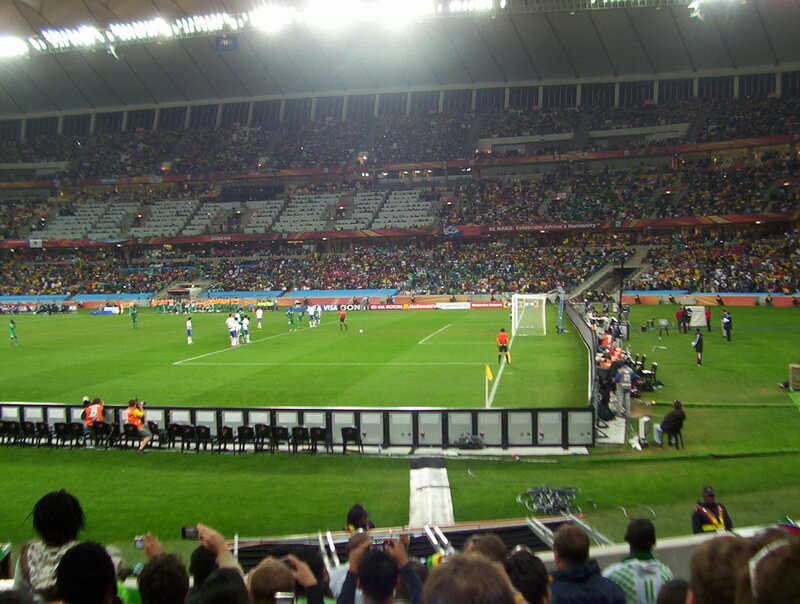 After pleasantries from FIFA President Sepp Blatter and South African President Jacob Zuma, the game began the way I expected, with Mexico dominating possession and chances. Giovanni dos Santos was very dangerous and should have put Mexico ahead in the first minute. However his shot was blocked at point blank range by Aaron Mokoena. Had they taken their chances in the first half, Mexico would have been 2 or 3 goals up by half time. South Africa barely got into the Mexico half of the field. Mexico’s first half dominance was so complete that the loudest cheer from South African fans I watched the game with came when a Mexican goal was disallowed for offside. The second loudest cheer was for a point blank reflex save by the South African goalkeeper Khune to deny Mexican striker Franco. The fact that Khune was so busy tells you a lot about how the first half went. South Africa emerge with more urgency in the second half. The lounge I am in absolutely erupts when Siphiwe Tshabalala scores to put South Africa ahead. Everyone is on their feet for two minutes celebrating, screaming, cheering, hugging and clapping. A South African guy high fives me in delight. He must have thought I was South African! 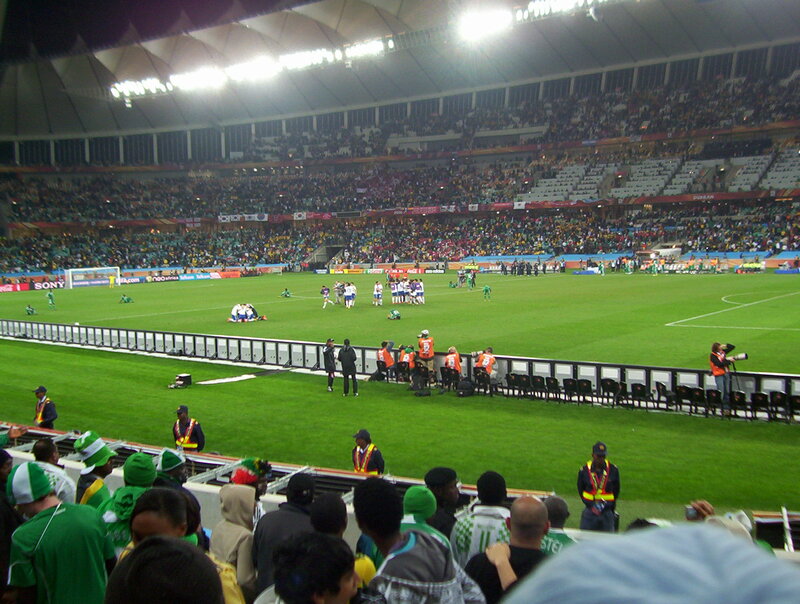 The fans’ delirious celebrations are matched by the South African players who stage a carefully choreographed dance on the pitch. When he came on as a sub, Bernard Parker got a huge roar from the fans I was watching with. They seem to love him. Not all fans were paying close attention. A young South African woman in front of me jumped, cheered and celebrated when Rafael Marquez equalised for Mexico! She seemed to temporarily forget that her team was wearing yellow, not black! 1-1 the final score. A fair result. It would have been harsh on Mexico not to get something from this game. South African fans and commentators are optimistic. They believe their team has a very good chance of getting our of this group. Strange sightings: John Barnes (ex Liverpool and England), the fantastically named Doctor Khumalo (ex South African international) and Stephen Keshi (ex Nigerian Captain and Mali and Togo coach) were guest commentators for South African TV channel Super Sport. The vuvuzela thing is a fun thing in moderation. 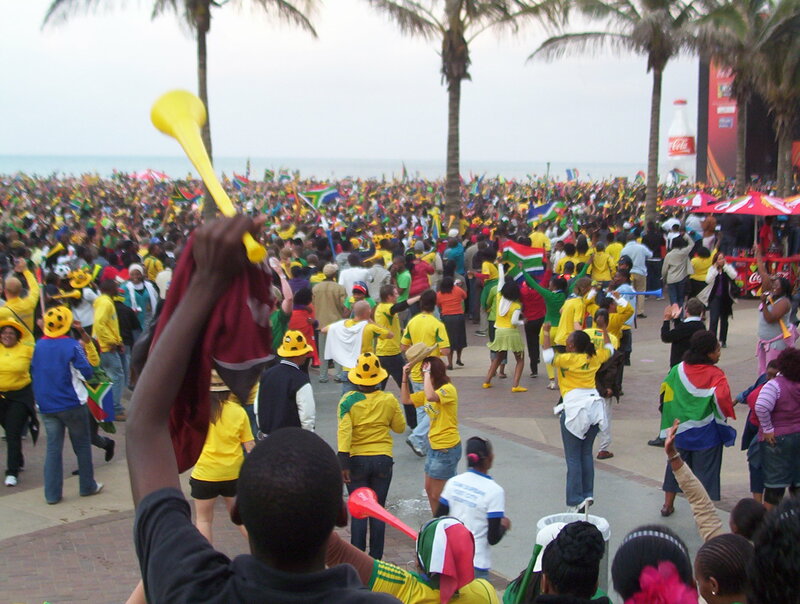 We’ve seen drums, trumpets, singing, whistles, cherring, booing and clapping at football stadiums, but the vuvuzela exceeds all of them in noise intensity. As I write my ears are ringing and sore from continual vuvuzela exposure at close quarters. 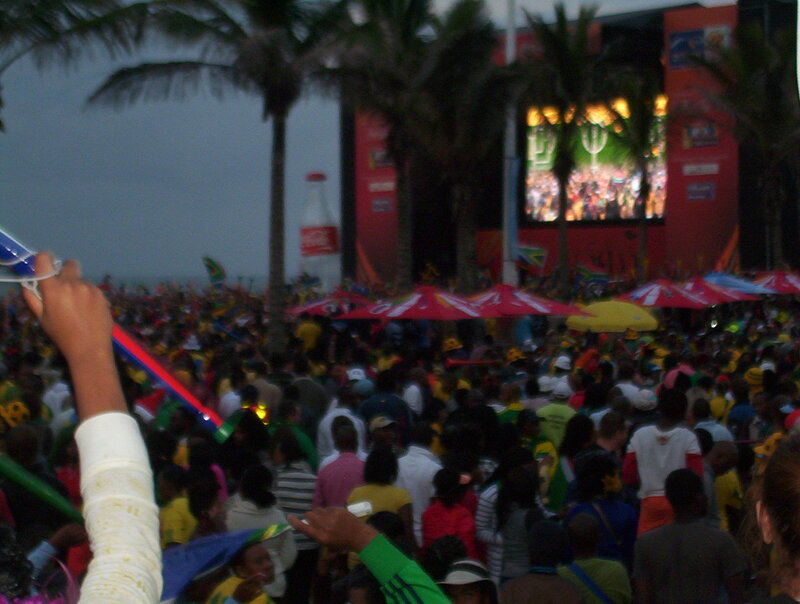 At airports, in the streets, bars, restaurants, indoors, outdoors, everyone is blowing the vuvuzela. The noise is not so deafening when one watches games on TV, but when someone right next to you blows it, the noise is akin to having an elephant roar into your ear. Also watched the 0-0 bore draw between France and Uruguay. Yawn! *Side note: Mandela is still worshipped with saintly reverence over here. 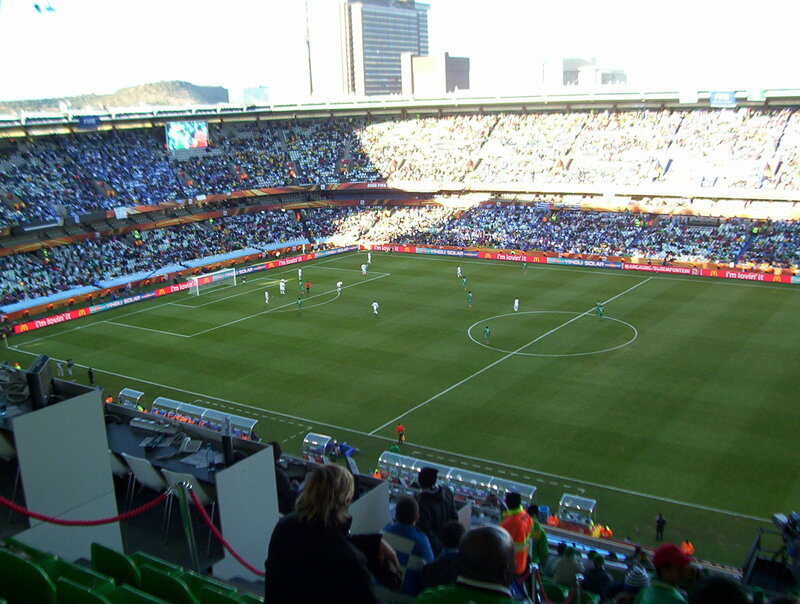 Even President Zuma referred to Mandela as “our icon” in his pre-match address in the stadium.